A bright, talented and ambitious lawyer who possesses a vast wealth of knowledge and has a proven record of providing indispensable advice to clients and delivering positive outcomes for them. A quick learner who can quickly absorb new situations and can communicate clearly and effectively with both legal professionals and members of the public. Constantly focused on resolving legal issues and always looking for ways to improve and evolve processes. Presently looking for a lawyer’s position that provides a high level of job satisfaction and is also diverse and challenging. Involved in practising law by giving authoritative advice to clients and representing them at court. Also responsible for coming up with practical solutions to the needs of clients by having a thorough and commercial approach to legal matters. Providing accurate, timely and effective legal advice to clients. Studying police reports, interview transcripts, medical records and other facts to make a case for the plaintiff. Advising colleagues on all legal matters, suggesting courses of action. Presenting evidence in court to support clients in legal proceedings. Giving oral arguments in a court of law. Shaping a client’s expectations on what can be realistically achieved. Advising clients on their legal rights and obligations. Getting to know clients and developing and maintaining relationships with them. Looking for evidence that will back up a clients case. Researching precedents in law libraries and then using the finding to provide a defence for their clients and support their cases in court. Visiting clients at their homes, work places or prison. Writing up legal documents like will, trusts and gifts. Preparing arguments to be heard in a trial. Gathering and organizing evidence on behalf of clients. Preparing questions to ask witnesses. Interviewing witnesses, defendants and clients. Appearing before legislative and regulatory bodies or government agencies. Negotiating with other barristers, solicitors, legal executives and their clients. Acting as a intermediary between barristers and clients. Interpreting and explaining the law clearly to both individual and business clients. Coordinating planning and building regulations applications. Advising businesses on the impact, interpretation and implementation of new policies and legislation. Possessing the ability to convincingly present a case in court. Good knowledge of civil, criminal, public, bankruptcy and administrative law. Understanding of contracts, government regulations, intellectual property rights, patents etc. Knowledge of tax and corporate law. Experience of supporting vulnerable clients. Knowledge of effective file management procedures. Ability to balance priorities and co-ordinate work effectively. Can analyse large amounts of information. Good project management and team building skills. 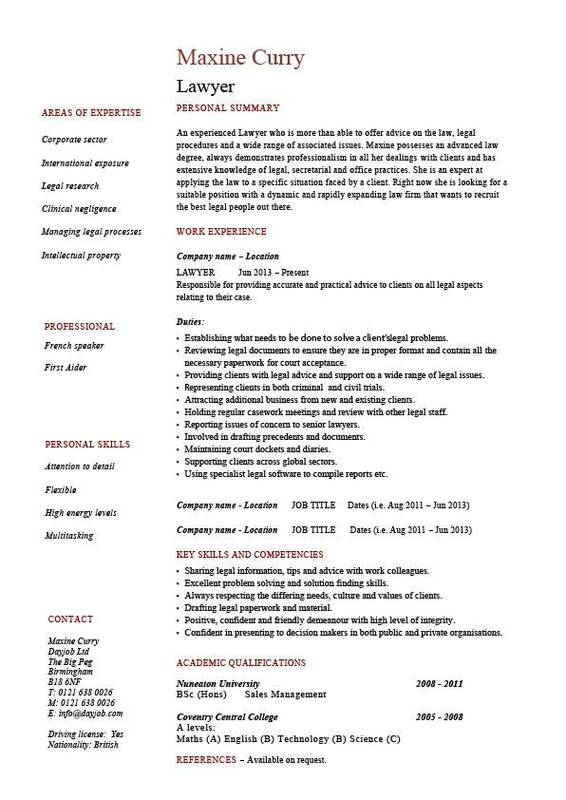 © This lawyer CV template is the copyright of Dayjob Ltd 2010. Job seekers may download and use this resume for their own personal use to help them create their own CV. You are most welcome to link to this page or any other page on our website. However this curriculum vitae sample must not be distributed or made available on other websites without our prior permission. For any questions relating to the use of these teacher CV templates please email: info@dayjob.com.